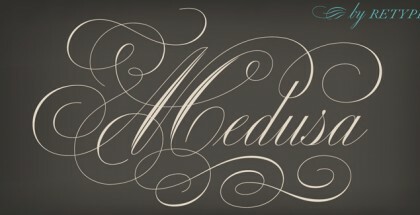 The story of Piel Script font is quite an exciting stuff! Ale Paul remembers that he’s been asked by a bunch of people in a short period of time to modify his existing fonts (Burgues Script and Adios) to fit the demands of tattoo design. Facing such request sometimes leads to controversial thoughts (we believe it’s really flattering if you see someone tattooed with your own typeface!) 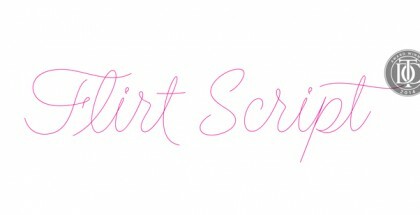 – luckily Ale decided to create a whole new font based mostly on Borgues Script – the Pile Script was born. We could easily describe it as a natural masterpiece but it’s something more than this – Piel Script is a dream-come-true for every tattoo artist and a real challenge even for an artist like Ale Paul and his team at Sudtipos. Well it’s quite obvious they did all the best in their work – swashes, alternates, ligatures, ornaments and decorations – everything needed to face the demands of the sophisticated tattoo art. “Scripts can’t get more personal than this” Ale says in official My Fonts presentation of Piel Script and we add words like useful, original, sophisticated and emotional. Tattoos are more than art – they are great responsibility mostly because they can’t be undone. Sudtipos created significant element of this art that no one will ever want to remove. Piel Script font received the Letter2 award, where they selected the best 53 typefaces of the last decade, organized by ATypI. Also was selected at the Bienal Tipos Latinos 2012.